Simulink® models are hierarchical, so you can build models using both top-down and bottom-up approaches. You can view the system at a high level, then drill down to see increasing levels of model detail. 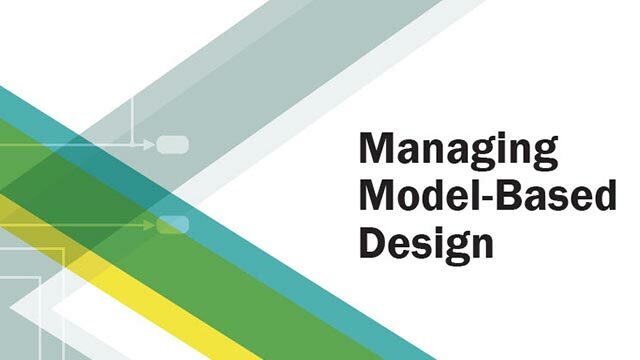 This approach provides insight into how a model is organized and how parts interact. A vehicle moves as the gas pedal is pressed. A proximity sensor measures its distance from an obstacle. An alert system generates an alarm based on that proximity. The alarm automatically controls the brake to avoid hitting the obstacle. To view the complete tree, click the Hide/Show Model Browser button at the bottom left corner of the model window. Observe that the subsystem is highlighted in the Model Browser. The address bar also shows which subsystem you are viewing. To open the subsystem in a separate window instead, right-click the subsystem name and select Open In New Window. Every input or output port on a subsystem has a corresponding Inport or Outport block inside the subsystem. These blocks indicate data transfer between a subsystem and its parent. In the case of multiple inputs or outputs, the number on the block designates which port it connects to on the subsystem. Data type: String, double, unsigned integer, etc. This shows that the Alert device component converts the alert index signal from a double to an integer. You can set the data type at sources, or use a Data Type Conversion block from the Signal Attributes library. The double data type, the default, provides the best numerical precision and is supported in all blocks. It also uses the most memory and computing power. Other numerical data types serve to model typical embedded systems where memory and computing power are limited. A block or signal with continuous dynamics is black. They update as often as Simulink requires to make the computations as close to the physical world as possible. A block or signal that is constant is magenta. They remain unchanged through simulation. A discrete block or signal that updates at the lowest fixed interval is red: They update only at fixed intervals. 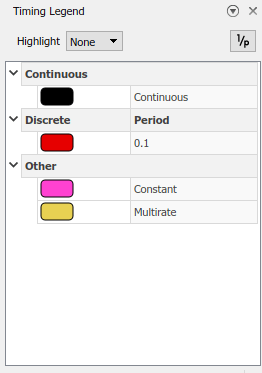 If the model contains components with different fixed sample times, each sample time has a different color. A subsystem that contains continuous and discrete components are yellow: They are hybrid systems. Open the Model Browser: Click the Hide/Show Model Browser button . Highlight the source of the output signal: Right-click the signal and select Highlight Signal to Source. This takes the editor into highlight mode. Click the editor to continue. Make sure there is a blue frame around the editor. To continue tracing the signal to its source, press the left arrow key. Keep tracing the signal to its source until you reach the Alert logic subsystem. You see that the Subtract block has two inputs. Choose the signal path from the Inport by pressing the down arrow key. To find the source of the discretization, keep pressing the left arrow and note the colors of port names that reflect the sample time. You find that the Zero-Order Hold block in the Sensor model subsystem does the conversion from continuous to discrete.